This is a sample entry from Tom Dosdall’s newsletter, Technical Ag Knowledge, published on Tuesday, April 11, 2017. 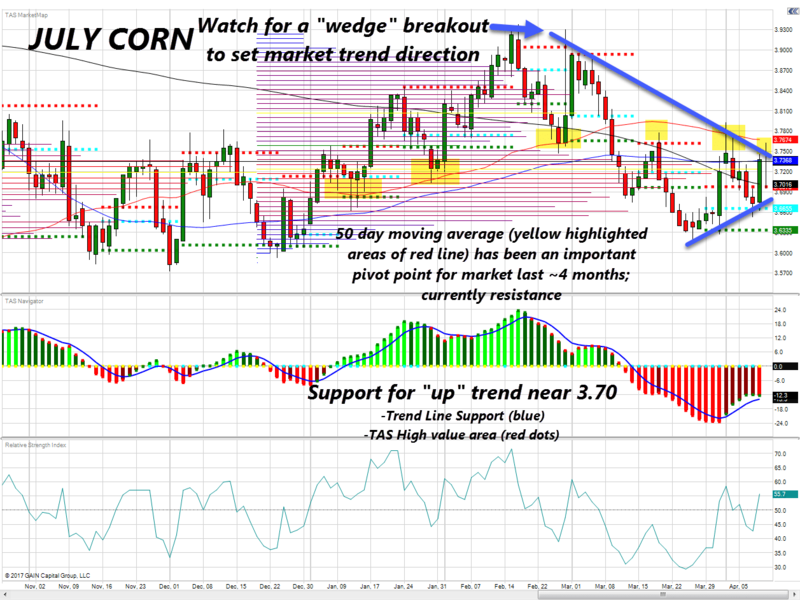 The corn market remains in a mildly bullish chart setup. The price picture improves significantly on a close outside of the wedge and above the 50 day moving average (376’6). Remember, funds are holding a sizable “short” position in corn so a potential weather issue related to US planting could help to rattle them out. Producers with old crop bushels are encouraged to consider their current cash basis vs expected cash basis on a possible board rally. Call us at 877-566-5463 to discuss transferring ownership to board if appropriate for your situation. 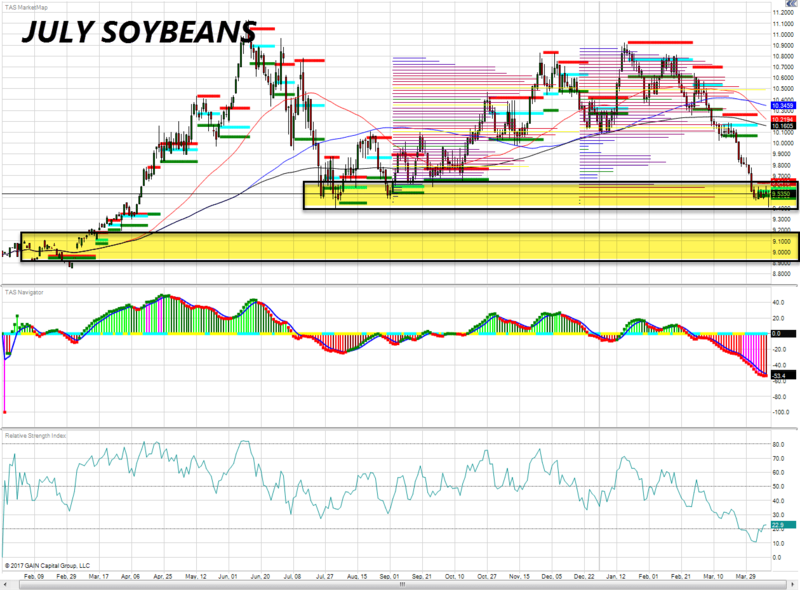 July Soybeans appeared ready to pick up momentum to the downside following Tuesday’s bearish supply numbers (WASDE) but managed to close back above the critical support line of 947’0. The market remains technically oversold and could be due for a short term bounce. Substantial rallies are still viewed as selling opportunities, given the global supply situation and potential for record US planted acres. 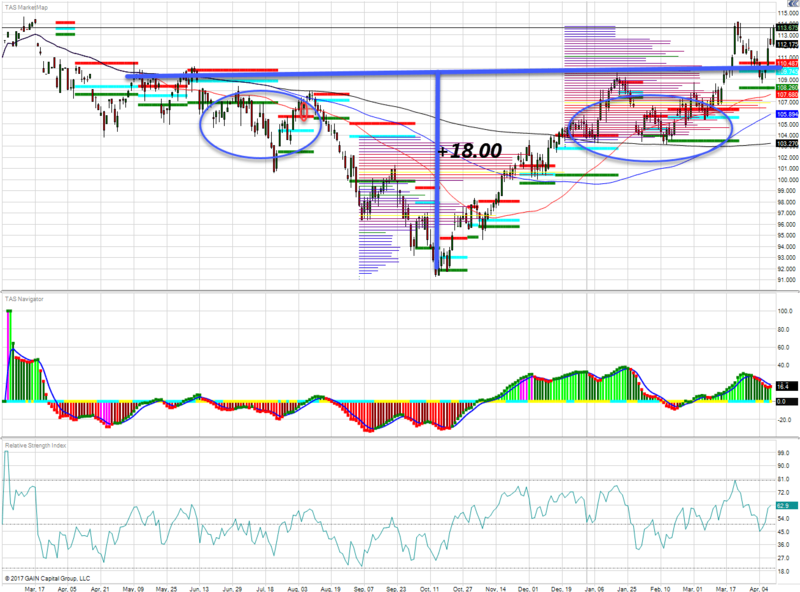 A close below 945’0 and the charts open up down to the next major support level near 900’0. A close above 964’0 and the potential for a rally of as much as $0.40 to $0.50 exists in my opinion. Deep in-the-money hedges should be rolled down here. Wheat may be benefitting from a bit of short covering as today’s report was rather neutral, in my opinion, as far as wheat supplies go. 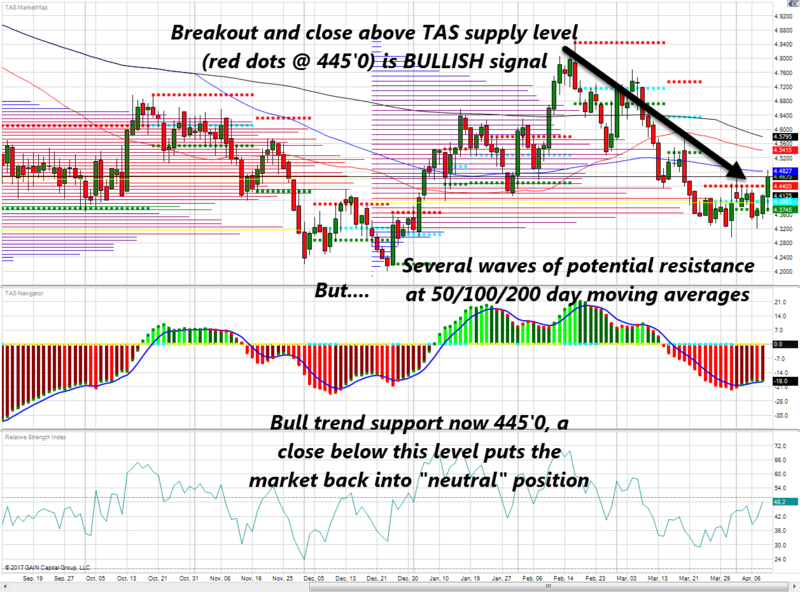 The close above 445’0, however, tips the scales bullish and could help to shake more of the funds loose. Before getting too excited, we must heed the 50, 100, and 200 day moving averages not too far away which could act as a headwind for any type of major rally. A push through these levels (448’0, 454’0, and 458’0 respectively) would go a long ways in helping to improve the technical picture even further. The longer term “inverted head and shoulders” breakout we’ve been spotlighting these past few weeks continues to hold the market above 110.00. As long as this remains the case we continue to favor the potential for higher cattle prices, per haps as high as 128.00 June using traditional head and shoulder projections. 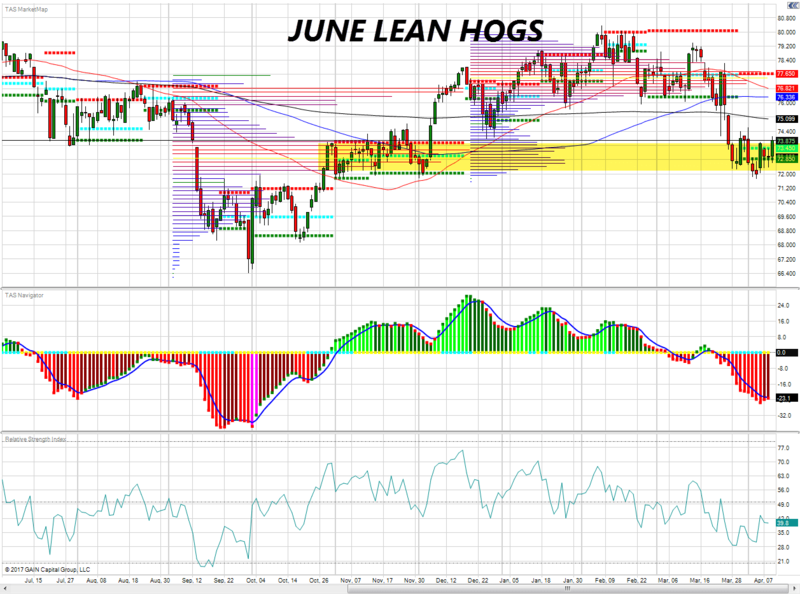 The June Lean Hogs could be carving out support near the Oct/Nov lows but bearish fundamentals may prove difficult to rally much pas the 200 day SMA near 75.100. I would view short term spikes in volatility as selling opportunities. A close below 72.850 again and the scales are tipped back bearish. Have a great afternoon/evening and call 877-566-5463 to discuss your positioning!